Employees told of secret meetings between a young brewery worker and his sweetheart at the mouth of the caves near the back of the brewery. All summer long, every Saturday night without fail, the lovers kept to their hidden rendezvous. In the cool air, amid the seclusion of huge wooden casks, their affections sparked in the lantern light. Then one fateful Saturday night, without warning, the young man missed his appointment. After waiting in vain for hours, the young lady returned home, only to learn of her lover’s serious accident. He had fallen on a stairway in one of the caves and hit his head. She rushed to his beside. He died soon after, never regaining consciousness. When the young woman died some weeks later, brewery workers were convinced it was due to broken heart. Before long, employees began reporting strange experiences in and near the caves. In fall, an apparition of the young lady was seen lingering at the mouth of the cave as she had done so often in life that summer. Later, masons reported luminous figures floating just beyond the same cave entrance. Over the years, workers also reported hearing disembodied speech and laughter among the casks. After 1906, the deep, dark caverns were largely forgotten, until a small portion was renovated and reopened as a museum in 1953. Today, this area is part of the The Miller Visitor Center’s free brewery tour. Although the conclusion of the tour includes an address by the “ghost” of Miller founder Frederick Miller projected on a cave wall, no one seems to recall the tragic tale of doomed lovers related in the Sentinel article. However, strange goings-on are still reported in and near the caves at The Miller Visitor Center (4251 West State Street, Milwaukee, WI). One confidential source, the wife of a former brewery worker, admitted her husband is still awakened by nightmares about his eerie (but, unfortunately, undisclosed) experiences in the caves. Recently workers at the Miller Inn, where tour-goers enjoy beer and soft drink samples, have also reported hearing mysterious footsteps after hours. So are the abandoned Miller caves still a catacomb of lost love? It’s hard to say since most of the tunnels are inaccessible, at least to the general public. Even so, some paranormal investigators might consider the caves a probable location for a residual or imprint haunting because they are carved from limestone hillsides. Paranormal celebrities often cite the well-known, but very controversial, idea (sometimes called “stone tape theory”) that the limestone could have recorded events from the tragic lover’s tryst, providing a ghostly playback years later. However, until a careful paranormal investigation is conducted in the caves, the ghost stories are nothing more than intriguing local folklore. Have you heard any stories from the Miller Caves or any other parts of the The Miller Visitor Center? If you have any additional information pertaining to this case, we’d love to hear from you. Speak up and help make a comprehensive Milwaukee hauntings database a reality. Please call (414) 807-7862 or email info@milwaukeeghosts.com. ~ by mkeghosts on February 14, 2010. I think that the “stone tape theory” is intriguing but I think a little knowledge about how it is possible for rocks of any kind could capture and release energy from an event would be helpful. First, there are 3 types of rocks that are commonly associated with paranormal activity. Those are limestone, quartz, and magnetite. Limestone is a sedimentary rock that usually forms in lakes, streams, rivers, oceans etc. Most Limestone is deposited in warm shallow seas, on carbonate shelves etc. Limestone is a carbonate rock mainly made up of calcite precipitated chemically or by organisms, and lime. Although some claim that limestone in the area could cause a haunting I would disagree due to the fact that it is made up of mainly living organisms. This doesn’t allow limestone to store or release energy, at least in my understanding of its make up. Magnetite is a mineral that is mainly found in igneous rocks, but also found in metamorphic and sedimentary rocks. Magnetite is highly magnetic. Based on the many theories surrounding magnetism and paranormal activity I would say that magnetite would serve as a good conduit for paranormal activity. Quartz is one of the most common minerals that are around. Quartz forms a significant part of most igneous rocks. When crystal quartz is cut at an exact angle to its axis a minute electrical charge is generated. This is why quartz was used in the transmitters of radios, TV’s, and radar. The very interesting thing about quartz is that it is commonly found in limestone cavities, meaning that hauntings that are attributed to the limestone could in fact be caused by the quartz deposits contained within. Overall, the science behind the make up of these three types of rocks provide the necessary components to form a type of battery that could store and then release energy that is absorbed through the environment. I would bet that the limestone caves that make up the Miller Caves have quartz deposits that would help sustain a residual type haunting. Hey Milw GT&I! I just joined the group, and am reading the old posts here. Just thought I’d share on this one. I used to work at Miller Brewery, and have personally run into the lady ghost in the article. She actually haunts the Miller Inn, moreso than the Caves. The Miller Inn is where the official tour ends up (in the winter time). I had to… See More lock the Inn at night, and check the doors. Twice she followed me through the Inn on my rounds…I could hear clothing rustling when I stopped walking, and she would mumble in my ear. It sounded very muffled, but the last time I ever went in there, she said, “Pay attention to me!” Right in my ear!! I made someone else lock the Inn after that…I refused to do it. Thank you for the great comment S.L. York! Yes, others have reported ghostly footsteps and whispers at the Miller Inn too. We would love to talk to you about your experiences there in more detail. Perhaps you could also put us in touch with additional witnesses. Please contact Allison Jornlin at your convenience by email at info@milwaukeeghosts.com or phone at 414-807-7862. I use to work in Security at the Milwaukee brewery for many years. While I was in Security I would work both second and third shift. I have never experienced anything in the Caves, but if you were to go up stairs into the Miller Inn you would feel such a eerie feeling like you where being watched where ever you went. Going into the Inn around 1:00am- 3:30am you would feel this all the time and no one, I mean no one would want to go in there around this time, but we had to. There were time’s you would hear foot step’s walking around on the wooden plank floors. I’m not talking about “floor boards squeaking” but legit foot steps. You knew it wasn’t yourself making the noise because you would be standing still and your the only person in the Inn. I can’t tell you how many times my hair would stand straight up and also getting the case of the goose bumps down my arms and cold chills just on certain parts on my body. Then seconds later I’m fine line nothing happen. There was a time when one guard went into the Inn around this time of night and he called over the radio that he’s chasing a “tall person dressed in all black” down the hallway on the second floor towards the kitchen. This “tall person” went out the back door. We never seen this person on the other side of the door but the door was open. The guard that was chasing “the tall person” was also a Milwaukee Police officer. He said he has never seen anything like this before in his life! After that night he always went in there with someone else. If you ever been here you would know you have to walk down many stairs when you leave out the back or you’ll fall a good ten feet if you tried to jump. You still couldn’t run away because you would be trapped in a fifteen foot iron gated fence area. Right in front of the Caves main entrance!! There are MANY places in the Brewery that are no longer used. One other time, I was in the Gettelman building that’s across the street from the Miller Tour Center (Miller bought Gettelman in the 60’s). It has the Quad Med office in it now. I was walking in the building around 1:00am – 2:00am to use the restroom. While walking to the restroom I heard someone say “Hello” loud clear as day in the next room that was not lighted at all, totally blacked out. It scared the living crap out of me because NO one is allowed in this area of the building unless you have access (which is not many employees have because whats in there). I searched the room not finding anyone. I even had some people review the Security tapes and card readers to see if anyone went in or out. Needless to say no one went in or out besides myself. Ever since then, when I would go into the building I would say ‘Hello’ out loud just to let who ever was in there know I’m in the building. I put all this on my child life, NO JOKE! * Did you or any of the others who had unusual experiences come up with any ideas as to who the ghost(s) may be? Or were there any legends about this of which you were made aware? * Did witnesses feel the ghost(s) were the spirits of males or females or both? * When you heard footsteps did you get any impressions as to what type of shoes the ghost who was making the sounds was wearing? * Did the “tall person” that gave chase seem to be a man or a woman? * Did the voice that greeted you seem to be male or female? Could you describe it (high or low, gravelly or clear, etc.)? * Can you email us the contact info for additional witnesses who would like to share their stories? Thanks again JJ! I would love to know more. Please call me (Allison) 414-FORTEAN (that’s 414-367-8326) at your convenience. The caves were hand dug in 1849 for the Charles and Lorenz Best during the construction of their Watertown Plank Road Brewery. Frederick J. Miller purchased the brewery in 1855. The caves were used for cold storage until 1906. Frederick J. Miller had dinner in the caves on the night of his death, May 11, 1888. 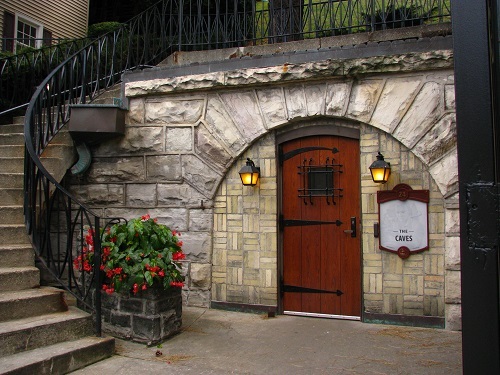 More great Miller Cave history can be found here: http://onmilwaukee.com/visitors/articles/millercaves.html.